I did this wash day on a very tight schedule because I was attend a "Ladies night out" with a bunch of friends so I have to complete not only the washing of my hair but also the grocery shopping and laundry before I went out. So just so you know it wasn't an epic fail but my style was a failure. Prepoo with Cantu Shea Butter leave in conditioning repair cream, under my conditioning cap for about 25 minutes. This is my third week using it has my prepoo and I'm still loving it. Shampoo with Loreal Total repair 5 restoring shampoo. I bought this product way before I began my healthy hair regime and decided to revisit it after reading Jen from Just Grow Already " 30 days with ceramide". I enjoyed how soft my hair felt after using it then and I'm enjoying it now. Tea Rinse with black tea, my shedding is down to a minimum with my weekly black tea rinse. Won't leave that step out anytime soon. Deep conditioned with ORS olive oil replenishing conditioner and my oil mix under my conditioning cap for 30 minutes. I really love using it as my DC and my oil mix gives it that extra. 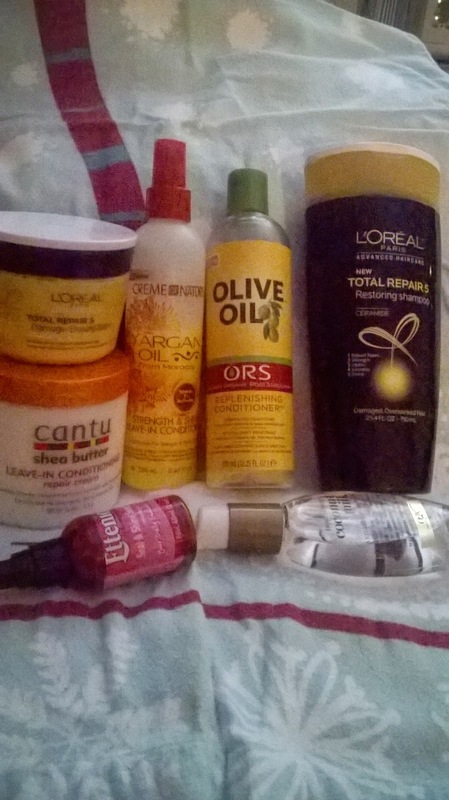 After rinsing out the deep conditioner I applied Loreal Total repair 5 damage eraser balm ( I used a lot of curl pudding to reset my flex rod set after each work out) I figured I something extra. I towel dry for about 20 minutes after which I detangled and put my hair in four sections. Apply Leave-in Creme of Nature strength and shine leave in conditioner along with OGX coconut milk antibreakage serum to each section before blow drying on low. I did not fully dry my hair (big mistake). Applied ettenio seal and shine then did three to four two strand twist in each section before doing a flex rod set. I really thought I had all the time in the world for my hair to be completely dry but I ended up with damp roots and cute curls. The curls eventually fell but had a great time at my Downton Abbey themed Ladies night. All in all it was a great wash day.